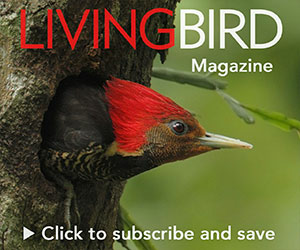 From the Autumn 2014 issue of Living Bird magazine. Although Hog Island is only a short boat ride from the Maine coast, it feels like a different world. People from around the country attend camps there and immerse themselves in nature. Photo by Cliff Beittel. It’s just a short walk to the place I’m looking for: across the lawn beside the old white dining hall, past the cabins, and into the woods along the shore, on a path cushioned by conifer needles. I sit on a lichen-covered rock beside the sea, where the breeze carries a bittersweet blend of tide-exposed mud and spruce forest. I remember these smells well—as does everyone who’s spent time on the Maine coast. Multicolored lobster buoys cover the bay below, amid islands scattered along the horizon. The sky is busy with the comings and goings of gulls; an Osprey passes overhead, carrying a fish; Common Eiders loaf just above the wrack line. And here comes a Black Guillemot, seemingly using all the muscle power it possesses to stay airborne. It plops onto the water with less than utter grace, and in an instant looks completely at home. Forty years ago I sat on this same rock and saw my first Black Guillemot, not to mention my first lobster buoys. I had just arrived at Hog Island, about 50 miles north of Portland, Maine, on Muscongus Bay, to attend a National Audubon Society ecology camp. I didn’t know that the next two weeks would change my life. Never before had I spent so much time immersed in nature, from dawn bird walks to morning botanizing to afternoon exploration of the intertidal zone. I met people from around the country who shared a love of outdoorsy things and the excitement of discovery. I recall seeing my first Laughing Gull and Olive-sided Flycatcher, and the exotic (to me) milieu of barnacles, limpets, and whelks. Though only a short boat ride from the mainland, Hog Island felt like a different world—as close to paradise as I could imagine. Audubon opened its first Hog Island camp in 1936; Roger Tory Peterson was the bird instructor. From the beginning the program emphasized teaching teachers, and over time an illustrious group of instructors passed on their knowledge to hundreds of campers. Attendance at the Maine camp began to decline in the 1990s, in line with Americans’ changing travel habits. After continuing financial problems, the Hog Island camp closed in 2009, and its buildings were boarded up. Enter Stephen Kress, who was the camp bird instructor when I met him in 1974. Back then, he was a young ornithologist with the ambitious idea of reintroducing Atlantic Puffins to Maine, where they had been extirpated in the late 19th century. Today, Steve is a National Audubon vice president and director of Audubon’s Seabird Restoration Program. Decades of work by his Puffin Project have resulted in around 1,000 pairs nesting on Maine islands. In 2010 Steve arranged to operate the Hog Island camp through the Seabird Restoration Program. “We could use Puffin Project people as staff, and it would be more efficient,” he says. A revitalized Friends of Hog Island group raised considerable money as well. “It’s a great success now, both financially and program-wise,” Steve said. The camp offers a series of one-week sessions on themes such as seabird biology, raptors, and fall migration. There’s a session especially for families and another for educators. And there’s one called “Joy of Birding,” which I was anticipating on my return to Muscongus Bay, arriving on a sunny Sunday in early June. From the hill on Audubon Road I looked across to 330-acre Hog Island and the buildings clustered on its northern tip: the Queen Mary, a combination dock, laboratory, and dorm; the Bridge, containing the dining hall and offices; and the Fish House, the camp meeting hall. Others had been drawn, at least in part, by the chance to see Steve Kress’s special birds. “I love puffins,” several campers said, “and I’m hoping to see one.” Quite plainly, the boat trip to the breeding island called Eastern Egg Rock was the most anticipated part of the week, but staff members cautioned that rough seas could disrupt plans. Field trips began the next day with a walk through Hog Island’s spruce forest. It became apparent that the species composition had changed since my first visit. The songs of Black-throated Green Warblers and Northern Parulas were ever-present, but Magnolia and Blackburnian warblers, both common before, were nowhere to be found. Though Redbreasted Nuthatches occasionally beeped and Golden-crowned Kinglets seeped, land birds in general seemed scarce. I wondered if the maturing conifers might have crowded out hardwood trees and open areas, lessening overall island diversity. Later that day there were two “shakedown cruises” circumnavigating Hog Island, with half the campers fitting on the boat for each trip. Harbor seals surfaced to watch us pass, and, for the beginners, the trip leaders pointed out differences among cormorants, loons, and ducks, including Common Eiders and Surf Scoters. As a bonus, we spotted a pair of Red-necked Grebes, which should already have departed for their nesting grounds. We also traveled to the mainland for a bird walk. During the first Audubon camp in 1936, Roger Tory Peterson and Allan Cruickshank, the renowned photographer and writer, devised a route through the village of Medomak. Ever since, Hog Island campers have taken the same stroll through woodland, fields, and marsh. For birders, this might be somewhat akin to a book-lover’s following Hemingway’s walk along the rue Mouffetard in the Latin Quarter, though instead of market stalls we found Gray Catbirds and Chestnut-sided Warblers, Eastern Bluebirds and Wood Ducks. And, most meaningful for me, a Bobolink perched in the same field where I saw my first one 40 years earlier. For those to whom Bobolinks are common neighbors it might seem odd, but that sighting fulfilled a dream I’d had since I first read Peterson’s description of this bird with “a dress suit on backwards” and lingered over Louis Agassiz Fuertes’s illustration of “Bubbling Bob” in The Burgess Bird Book for Children. Sea conditions allowed half the campers to depart for Eastern Egg Rock the next day, while the rest of us again visited sites on the mainland. In the afternoon the boat group returned, bundled up and red-faced from the chilly ride but full of excitement about their trip. They’d seen lots of puffins. We listened to their stories, hopeful about our own prospects. The weather the next day couldn’t have been better, with blue sky and gentle waves for our cruise. We passed rocky islands, home to nesting cormorants and gulls; with the engine dead slow, we scanned a big flock of Black Scoters dusted with White-winged Scoters around the edges, like powdered sugar on a pan of brownies. Soon enough, Eastern Egg Rock rose on the horizon—seven acres of boulders and scrubby vegetation. Almost before our anticipation had a chance to build, puffins began appearing in the water nearby: one to port, another to starboard, and then groups of two or three all around. The mood on the boat was as sunny as the weather, as bright as the puffins’ multicolored bills. Then, somewhat unexpectedly, one of the leaders spotted two Razorbills standing upright on the shore of the island, and soon others were seen swimming close to our boat. Razorbills aren’t known to nest on Eastern Egg Rock, but they do breed on a few other Maine islands. It was easy to identify these penguinesque birds, but sorting out the island’s nesting terns was another matter. Most of the gracefully whirling and swooping birds were Common Terns, but the trip leaders took pains to point out the other two species present: Arctic Tern and Roseate Tern. This was a fine day, to be sure, continuing with lunch on Harbor Island. We had constant views of seabirds, seals, and Bald Eagles as we navigated around some of the dozens of islands in Muscongus Bay. Though we had one more day on Hog Island, the trip to Eastern Egg Rock was the highlight for just about every camper. Inevitably, my experience at the camp wasn’t as emotionally powerful as that trip 40 years ago. Since then I’d spent lots of time on seacoasts and islands. A return couldn’t possibly be as transformative as my initiation to these habitats, awash in the hopeful enthusiasm of youth. But the Maine coast is a lovely landscape no matter how many times you’ve seen it. I knew that I’d see Ospreys soaring, see Bobolinks in song flight, and hear the twitterings of Winter Wrens at the Hog Island camp, and if they weren’t new this time they were reminders of what we love about nature’s wonders. How is it that I’ve spent the better part of my adult life traveling to the world’s odd places, writing about natural history? The answers to questions like that are always complex, but much of the inspiration, I’m certain, came from those two weeks in Maine 40 years ago. For that, Hog Island and all its scents and sights will always be a memory as evocative as salt air and the laughter of a loon. Goodbye, Yellow-rump: Will We See a Return to Myrtle and Audubon's Warblers?